Breakfast in Asia has always been a challenge for me- I was raised on breakfast foods primary consisting of eggs, breads, muesli, cereals with some sausage or bacon. Salmon would be the only fish I’d eat for breakfast, but that came as an adult. Rice or noodles were never on the menu. You’re not going to find breads, cereals or a western breakfast on the streets here, rice and noodle soups are the staples. What you will find is jook (pronounced joke). And good jook is, well, goooood. Jook is slowly boiled rice- done properly it’s not runny or sticky- with some meat and fixings thrown in; it’s a porridge. Generally the meat is ground pork balls that have been boiled and other parts of the pig, like sliced intestines, thrown in for good measure. Spring onions and sliced ginger are the primary garnish, eggs- soft boiled, hard boiled or salt- can be added. The rice is cooking in a massive pot, joke is served piping hot and each bowl is made to order. I opt for the ground pork balls and spring onion- I’m still not big into the intestines and such and ginger is too strong a flavor for me. The picture above is without any egg. Like all Thai dishes, condiments are added by the eater, the common condiments are white pepper and a vinegar that includes some mild chili. Try it, it’s great and will cost around thb30, that’s about US$1 for a great breakfast. Follow up- the day after I wrote this I did indeed have rice and spicy food for breakfast, have a read about that breakfast here. 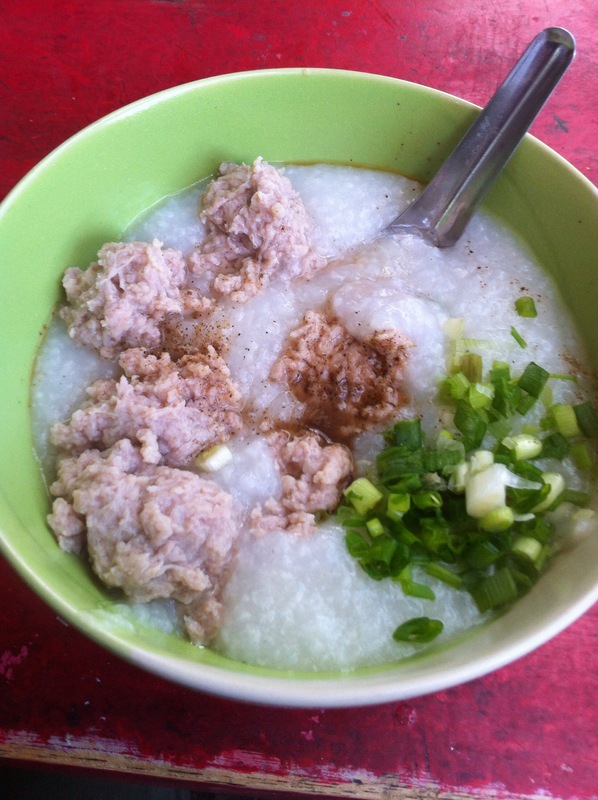 This entry was posted in Food & Restaurants and tagged Bangkok, breakfast, street food. Bookmark the permalink.